Welcome to our VMAC LEAN Blog Series. Here we’ll share various aspects of LEAN and how we specifically apply them to our everyday operations. LEAN Enterprise is part of VMAC’s continuous improvement culture—driven by the goal of maximizing value and minimizing waste. The advancements and improvements make for a healthier organization and allow us to pass additional value on to our customers. See an intro to VMAC LEAN Enterprise. The first blog in our LEAN series is on VMAC’s 5S Program. The 5S methodology is a valuable tool in VMAC’s LEAN culture, developed to improve organizational efficiency through 5 different steps. The term 5S originates from five Japanese words starting with the letter S: Seiri, Seiton, Seiso, Seiketsu, and Shitsuke. Translated, Seiri means tidiness, Seiton means orderliness, Seiso means cleanliness, Seiketsu means standardization, and Shitsuke means discipline. To stay consistent with the five S’s, the English terms have been modified to Sort (Seiri), Set in Order (Seiton), Shine (Seiso), Standardize (Seiketsu), and Sustain (Shitsuke). 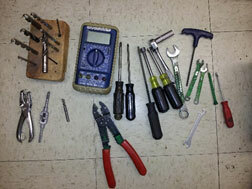 The Electrical Department’s Red Tag items. The first step in the 5S methodology is to Sort. Getting a workspace sorted is important as it helps spot and address any problems with efficiency right away. This means sorting through each item in the area, keeping only what is needed. Each item should be inventoried and classified—it’s important to be honest about each item’s purpose as it can be a slippery slope to save items just because one day they might be needed. At VMAC, each coworker is responsible for sorting their workspaces, and teams work together to tidy shared spaces. While sorting, it’s routine to “red tag” items that are not needed in the area or have no home. Each department at VMAC has its own Red Tag Area where these items are left for 30 days. During this 30-day period, potential owners are welcome to review the item to see if it can be repurposed. After 30 days, the items are recycled or disposed of. An example of a shadow board in VMAC’s Quality Department. Note the outlines for each tool, as well as the labels. specific place for each item. Items should be identifiable, easy to access, and set so that anyone can tell where to return something. Items that are not frequently used can be stored out of the way. 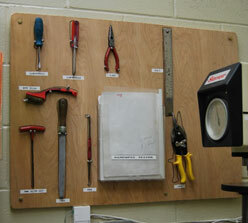 At VMAC, a combination of labels and tool shadow boards are used to keep items organized. Labels are placed on the outside of cabinets so that coworkers are able to see where items are stored without having to search through shelves and storage areas. In the shops, tool shadow boards provide a visual aid to quickly identify missing items, and show where items should be returned. Floors are swept clean every day in the shops. After a workspace has been sorted and set in order, it’s now time to Shine it up. This means keeping the area clean and in ready-to-use condition at all times. At the end of the day each area should be returned to the clean state it was in at the start of the work day. While cleaning, VMAC coworkers take the time to inspect machines, equipment and tools to ensure everything is in good condition. In the shops and offices, each coworker is responsible for keeping their own work space clean as well as common areas and shared equipment. Now that the area has been organized and cleaned, it’s time to Standardize—maintain uniformity and follow best practices in the workplace. 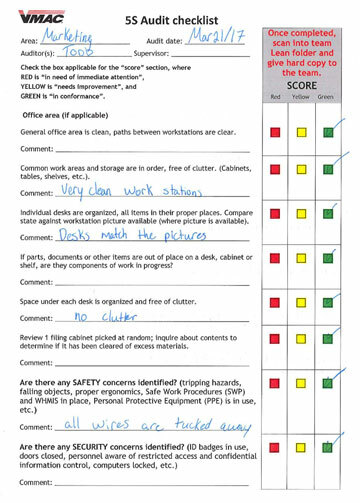 Visual aids, simple work instructions, and documentation help ensure standardization. For example, every VMAC department has a 5S schedule posted to show who’s in charge of keeping communal areas clean and tidy. The schedule also specifies if each task is to be completed daily, weekly, bi-weekly, or monthly. At VMAC, standardization is ongoing as best practices evolve with experience and changing requirements. 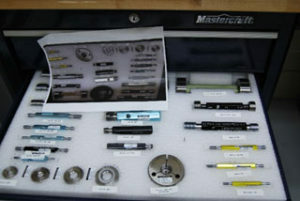 This photo shows a drawer of tools, each with their own space. There’s also a photo included for reference, which shows how the drawer is supposed to look. The 5S methodology is an ongoing commitment to organization and efficiency, and the final step involves Sustaining progress made, even as new equipment, products, and policies are implemented. Continuing to review systems helps prevent new challenges from occurring. For example, a common challenge is maintaining a clutter-free workspace. Once an area has been 5S’d, there’s often lots of free space which can attract new clutter. For this reason, constant vigilance is the key to 5S at VMAC. This document is a recent example of the Marketing Department’s recent 5S Audit. As part of the Sustain step, VMAC coworkers perform monthly 5S audits. What’s more, coworkers audit departments that are not their own, to allow for a fresh set of eyes to identify opportunities. LEAN coaches are also available to help guide coworkers in this exercise. LEAN is part of each VMAC coworker’s individual performance evaluation; this encourages everyone to make LEAN and 5S a priority. 5S wins are celebrated as well, with before and after photos posted to show off each department’s progress. Success stories are shared in the monthly VMAC newsletter as well, inspiring coworkers to continue their commitment to LEAN. 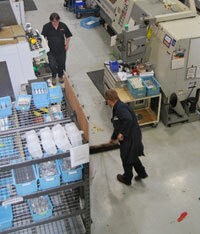 Learn more about VMAC and our company culture, or lean manufacturing. Interested in our line of compact and powerful air compressors? Visit our air compressors page.